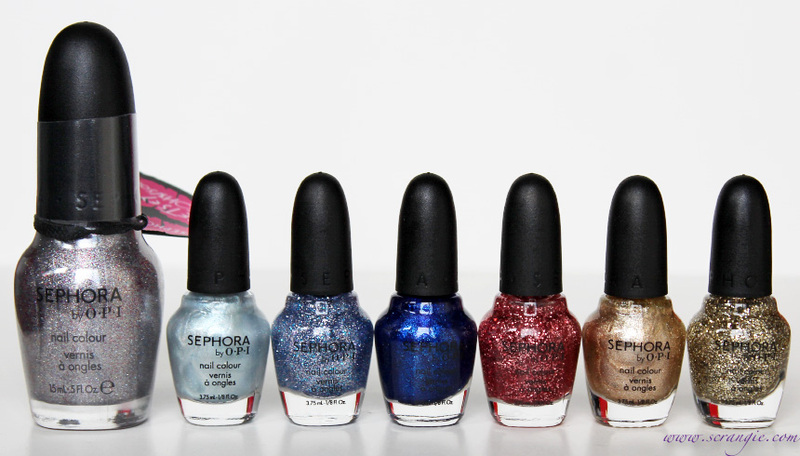 Part of the new Sephora-exclusive Disney Cinderella collection is this set of six mini polishes. As far as I'm aware, these are only available as miniatures as part of a set and are not available individually in full-sized bottles. The set is called A Brush With Fate and it's $24.50 for six 3.75ml (0.13 oz) polishes. Sephora by OPI So Totally Enchanted. Very light silver frost with subtle blue duochrome plus gold and silver microglitter. To me, this is the most interesting color in the set. It's not straight silver, nor is it straight blue, but a color that constantly shifts between the two. 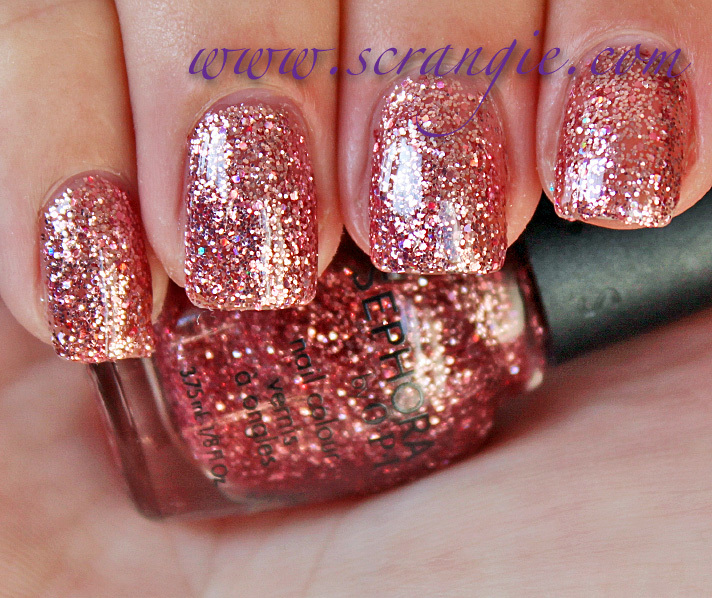 The microglitter is sparse, but it's very pretty and adds a magical look to the polish. It also stays smooth against the frosty metallic base; it doesn't look lumpy like a lot of frost/glitter combinations tend to do. 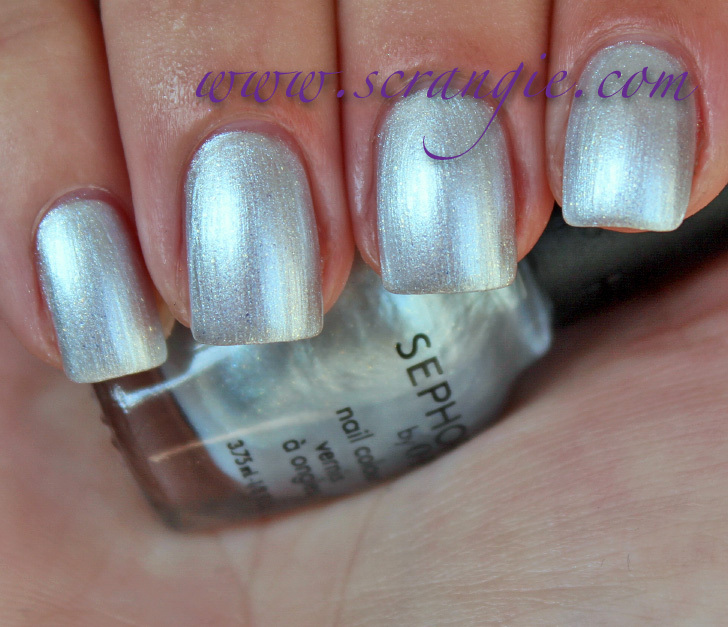 Sephora by OPI Step Off, Sister! A mixture of fine blue and silver glitter in a clear base. Sephora.com describes this as purple, but it's not purple at all. Still, it is pretty and sparkly, very delicate/twinkly and fits the Cinderella theme extremely well. Sephora by OPI I Blue My Curfew. A medium/borderline dark vibrant blue shimmer base with silvery blue and aqua crushed flake glitter. It sparkles like a glass fleck finish, but the shimmer/glitter particles are flatter and more random than in a true glass fleck. Sephora by OPI Bibbidi, Bobbidi, Pink! 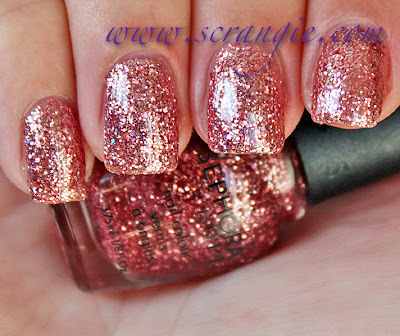 Medium-sized light, warm, rosy-pink glitter with a tiny, random amount of holographic glitter in a clear base. Eh... I have a lot of pink glitters that are almost this exact same color and nothing about this makes it stand out from the crowd. It's pretty, but it's not unique. Sephora by OPI Self Maid Millionaire. Light golden bronze foil. Another color that's not really unique, but still pretty. I love a good foil, and this one has all the shininess and gritty-looking sparkle that makes foils so eye-catching. 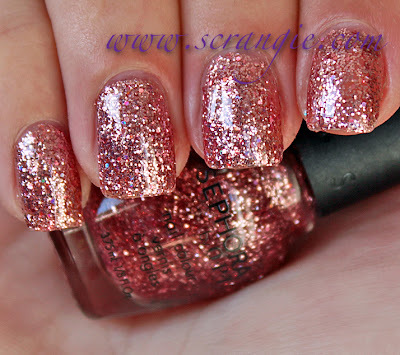 Sephora by OPI Rags to Rhinestones. Light yellow-toned gold glitter in a clear base. I feel like this one is a waste. These types of sheer/sparsely packed gold glitters are a dime a dozen. They could have filled the sixth slot in the collection with something more interesting and less easily duplicated, though I suppose it is good for layering with the other shades. Bit of a disappointment. Since these are mini polishes, I thought it might be useful to give a size comparison with a full-sized Sephora by OPI polish. Sephora by OPI minis are quite small; the ones in this kit are only one eighth of an ounce, while a full-sized bottle is a half ounce. The formula on these was good. Thin and smooth on the shimmer shades, a little thicker on the glitters. Easy application, good brush, no problems at all. I did three coats of each polish in these pictures and all but Rags to Rhinestones were opaque in three. That one's probably best left for layering. Dry time was average. While I think this set as a whole is very cute (nice collectable packaging), and the colors fit the Cinderella theme perfectly, I don't think the polishes themselves are terribly interesting. So Totally Enchanted is the only unique color in the set. It's my favorite one, closely followed by I Blue My Curfew. Disney collectors will probably want this set regardless, and it's just under $25 for the whole set, so it's not going to put much of a dent in your wallet. Still, I wish that they had made the colors a bit more interesting considering that it's a special, Sephora-exclusive, Disney princess-themed collection! The Sephora by OPI A Brush With Fate set is available online now for Sephora Beauty Insiders and will be officially launching in early October. I need to get this right now!!!!!! I wish I could buy So Totally Enchanted on its own. Not that great, but the Cinderella theme is so cute! These are cute, but like you said above, not terribly unique. That's a shame for us collectors, but this would probably be a great gift for a girlfriend, or even a younger member of the family who isn't into buying or wearing nail polish all the time. The fact that it is a mini set, tells me that's probably what Sephora by OPI had in mind when they released this. Great swatches! Nice theme but none of these colors can compare to Sinful Colors Cinderella. That color just captures the essence of Cinderella, her dress, her castle! These are all pretty, and they managed to make an extremely likable collection of colors, but none of them are that exciting. And I know myself, I'd never use these more than once because there's so little product in each bottle, and I'd be scared of running out. I ordered this set a couple days ago and I'm waiting for it to get here. (I even signed up for Beauty Exclusive just to get it!) I guess it's because all the classic Disney movies were such a big part of my childhood. I bought this set as soon as I heard about it. I didn't pay to much attention to the colors but now after seeing your swatches I have to agree on the lack of originality. I don't regret buying them because I love Disney, especially Cinderella, but I feel like this collection could have been so much more. Do you have any tips for removing the glitters? Man they are stubborn!! Very pretty colors but they are not as stunning or original as I was expecting. Gorgeous swatches! I really like Step Off, Sister. Too bad they don't sell them individually in full size. The blue one, I blue my curfew, is really gorgeous. It reminds me of another blue polish, but I can't remind which ATM. I feel totally 'meh' about this collection. But, because it's marketed as Disney, it will make tons of money regardless :) Geesh though... they couldn't have made LE packaging or something? Cinderella's type of blue is one of my favorite blues ever. I was hoping I Blue My Curfew (cute name) would be something closer to it..Its just a really pretty lightish blue color. The rest of the colors are lovely but not a must buy for me.